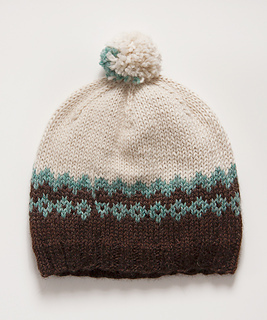 This cozy topper features a little bit of colorwork and a cheerful pom-pom. 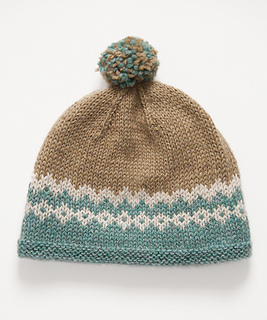 And in worsted weight, this knits up quickly, making it a wonderful last minute gift. 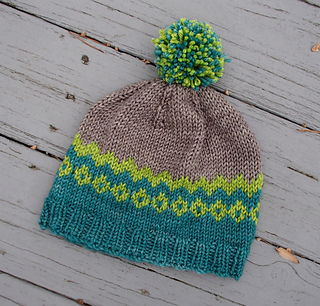 If you’re new to colorwork, this pattern has all the right ingredients to make this a gentle approach: a small pattern repeat, worked in the round, with worsted weight yarn. 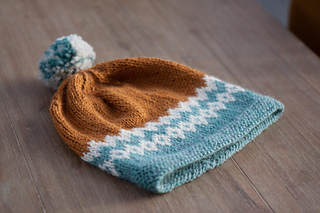 And as an added bonus, this is an excellent stashbusting project. 1 skein each heavy worsted yarn, in colors A, B & C.
Shown in Mirasol Miski 100% Llama 82 yards / 50 grams. 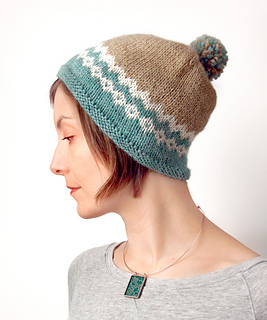 Tip: Each color uses a partial skein, and the distribution is approximately 35 g A, 35 g C, 12 g B. 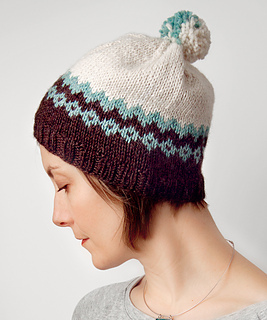 These requirements are rounded up for safety, but you can make two hats from four 50-gram skeins.